I was on my way the other day to, what I considered, a fairly important meeting when I was delayed by a Robin. The Robin was sitting in the middle of the driveway and didn't seem to be in any particular mood to move. I inched forward in my impatience and still the bird stayed there staring at me, I assumed. I wondered if the bird had been stunned by something. It sort of looked like it was surprised to find itself where it was, if birds can actually have such a look, and I like to think they can. After what seemed like a long time, in no big hurry, it moved out of my way and let me pass. I haven't seen it, or any other robins since. No doubt about it, in my part of the world, the Robin is considered a sign of Spring. 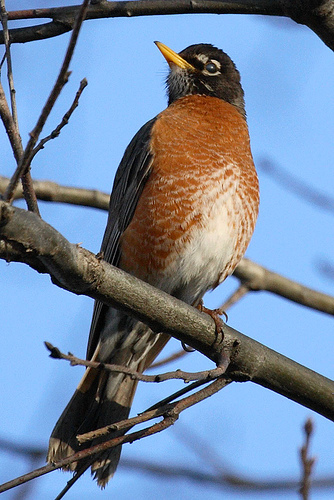 I got today's picture from http://www.symbolic-meanings.com/2008/03/16/massive-red-robin-sighting-symbolic-interpretation/. She agrees with that assumption. In fact, this is a great site in my opinion and I've "ended up there" a couple of times lately, which again may be a sign! I wrote about the appearance of robins last year. They came very early last year and rumor had it they were a bit confused or displaced robins when they arrived in February http://pixiedusthealing.blogspot.ca/2012/02/animal-signs-robin.html I welcomed than anyway. We haven't seen a lot of real spring signs yet, so the robin was a happy occurrence for sure this year. If I had of paid attention to that particular message on the way to my meeting I might have had a more joyful day I think. Sorry Robin for being so stunned... and thank you for the message, even if I am a little late on the draw. So today, a couple of days since I've seen the Robin, we also enter a New Moon in Aries phase. New moons are always about new beginnings and the presence of this moon in Aries means energy is really focused on initiating projects and doing what makes us feel alive. http://pixiedusthealing.blogspot.ca/2012/03/new-moon-in-aries.html This year I think I'll worry less abut "butting heads" than I did last year. Under the energy of the New Moon in Aries we may find it easier to listen to our muse first and others second. That seems to be a nice match for the Robin's message to me. There is lots of darkness and angst in the world. It's everywhere we look. But so too is there a chance for new beginnings. It's everywhere we look. And at this particular time of the year, we may be that much more able to bring this new energy, new beginnings, light, laughter and joy into our lives. So why not do it?? It's perhaps easier to bring in darkness. We are drawn to tales of woe. We listen for various reasons; because we think we should, because we think we have the solutions, because we might be able to make a rescue, because we feel guilty that we aren't experiencing such pain and think we should somehow share the load, because we want to feel lucky for what we do,have or don't have... And the list goes on and on. And once you get pulled into the drama tornado http://pixiedusthealing.blogspot.ca/2011/09/detachment-from-drama-tornadoes.html it's really hard to get out again. The tornado has an energy all it's own and before you know it, everyone is in the darkness and you no longer know where the light switch even is. Springtime seems a time of fluctuating opportunity. For parts of the day it's dark and gloomy, then all of a sudden the sun comes out only to disappear a few minutes later. From insid,e it often looks cold and dreary, only to discover in reality it's quite warm and pleasant out there. It seems like the energy of Spring suggests a chance to go to one side or the other; light or dark. Both opportunities are equally there- ours for the taking. I choose the lighter side of life. So in this new moon phase, I'm going to choose the light. I'm going to follow the muse to what feels light and right. I'm going to take that on as a project. I'll "embrace the light" without apology, guilt, angst, or misgivings. I understand wanting to stay in the darkness. There is a sense of comfort in pulling the covers over your head, closing your eyes and feeling the weightiness of "all". There is nothing wrong with staying in the dark if you choose to. But, I'm not staying there to keep anyone company. Let me know when you want me to come back and turn on the light. That Robin I saw was all by himself. Perhaps he was the first guy sent out to see if living conditions were sensible out there in the light. I read that in some parts of the world, Robins don't actually migrate away, they just go deeper into the darkness of the woods during the winter. I guess the darkness doesn't go anywhere but we can choose to step out of it and into the light. Like the Robin, I'm prepared to go there alone for a bit if I have to. That's what the muse is all about. It doesn't follow the crowd, popular thought, or the comfort zone. It follows the light. Happy Spring. Enjoy the Newness of the Moon! !